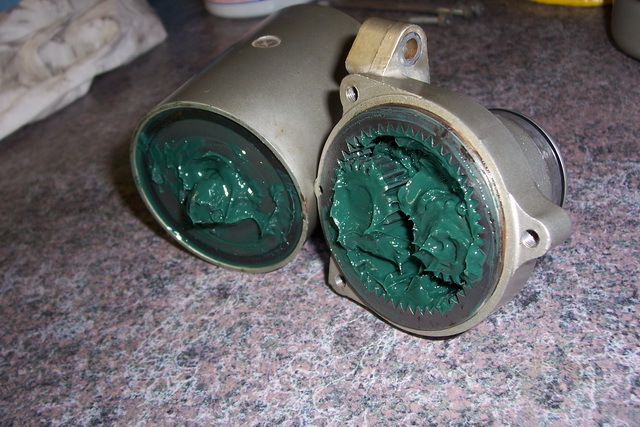 Clean the starter housing with alcohol and a tooth brush. Make sure all the grease is off the front end. Make sure you rinse it well and blow dry it well. Set it aside. These are nice and clean. Cleaning the Armature is easy but a very important step. Clean everything off with Mineral Spirits and a toothbrush making sure you get into the groves between the commutator conductors. Dry everything off with a clean cloth. 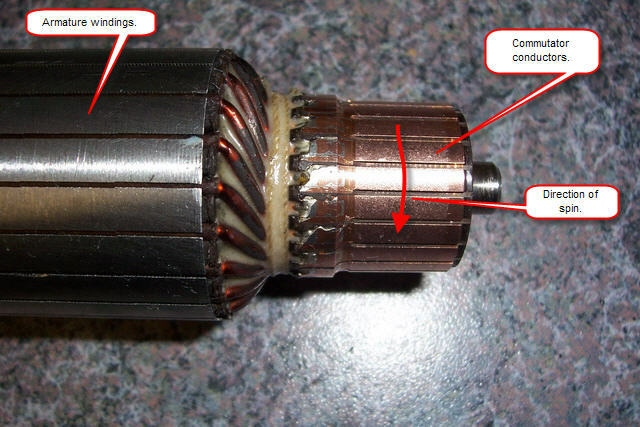 Take 000 steel wool and dip it into clean mineral spirits and then start to clean the commutator conductors. Clean it in the direction of the spin of the Armature. You want to go with the â€œgrainâ€� of the rotational marks on the commutator â€œfingersâ€� not against them. Do this light enough to remove the carbon build up and no more. Just get it clean. You are not trying to resurface it!!! Also, clean the armature winding itself with the steel wool especially if there is rust on it. Remember, gentle is the word of the day here. When done, dry it off and then clean the whole thing again with Alcohol and pay extra attention to the commutator conductors, cleaning well in between them with a clean toothbrush. Make sure there is no steel wool strands left over stuck to something. Put a very small amount of grease on the inside surface of the brass bushing in the starter housingâ€¦ just a film of it. Reassemble the Armature into the starter housing and donâ€™t forget the washers and their proper sequence. Carefully install the Brush Cover making sure the brushes move in and out freely. Gently spin the Armature. It will probably spin only one way due to the direction of the ware on the brushes. Screw down the + wire that comes up from the starter housing. 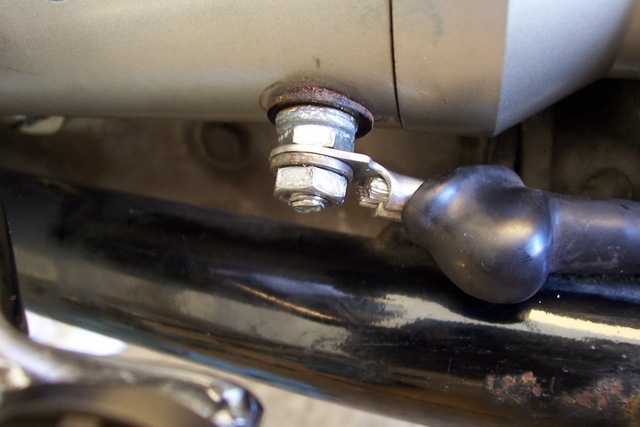 Again, make sure you hold it with your fingers so your torque does not break the insulator below. Tighten it well. Set this clean assemble off to the side. Itâ€™s time to get messy! Cleaning the reduction gear head assembly is messy with all the grease involved but not hard. Remove the Circlip and push the shaft through the â€œheadâ€�. The bearing that is left in the head does not have to be removed. The head can be cleaned with this in place. Clean the inside of the head with mineral spirits and then hot soapy water. Blow dry it when it is completely clean. Clean the â€œneckâ€� of the head well. Remove the â€œOâ€� ring and clean the grove. Remove the 2 gears from the shaft and clean with mineral spirits. Set them off to the side. Remove all the grease from the face and clean well. 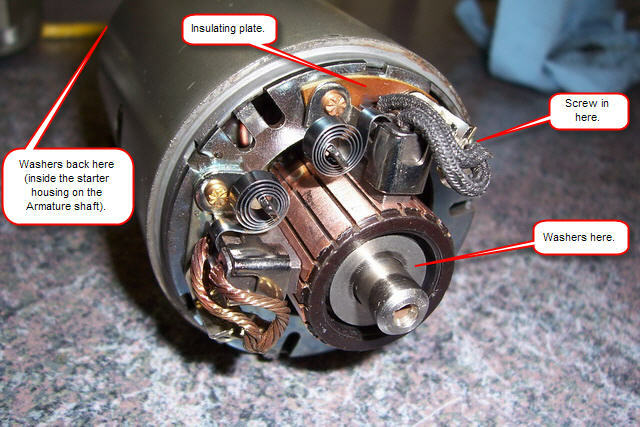 Donâ€™t use mineral sprites unless you plan to repack the second non-sealed bearing that is still on the shaft. I planed to do this so I used the mineral spirits. Blow dry this extremely well. 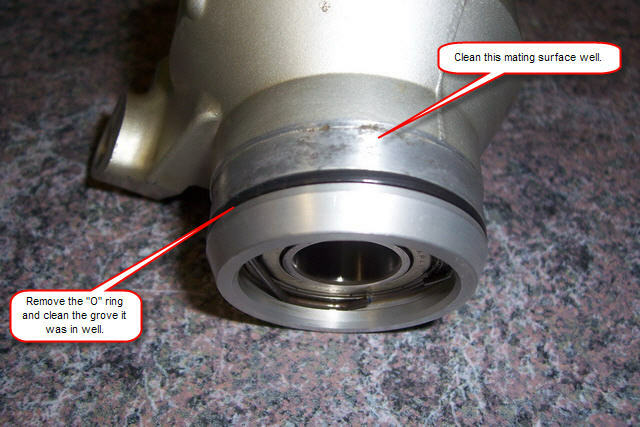 You want the bearing super clean. Now comes the grease! 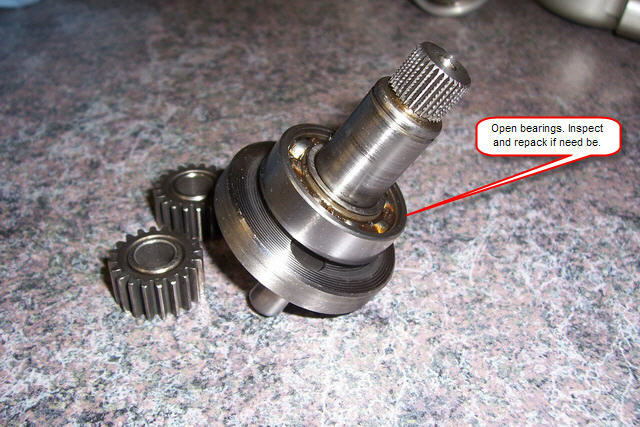 First, repack the bearings if you cleaned them with solvents. Make sure they are packed well. When done, insert the shaft back into the head and install the Circlip. Put a little grease on each of the 2 shafts that the gears go on and then mount the two gears. Using copious amounts of grease, almost fill up the gear cavity and make sure there is grease in every nook-and-cranny. Add a thin layer of grease to the face of the starter housing. Add your clean rubber gasket to the end cap. Carefully install the end cap after adding a film of grease to the brass bushing inside the end cap. 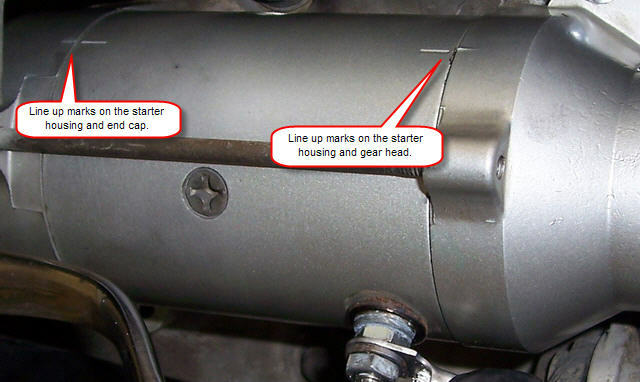 Stand the starter up on its end and install the head. It may take a few tries to get this lined up due to the gears but it will go in place. MAKE SURE the case marks line up during the reassembly. This picture shows the line-up-marks while the starter was still on the bike. (I forgot to take a picture while it was out.) Look for theses marks. Install the 3 long screws. 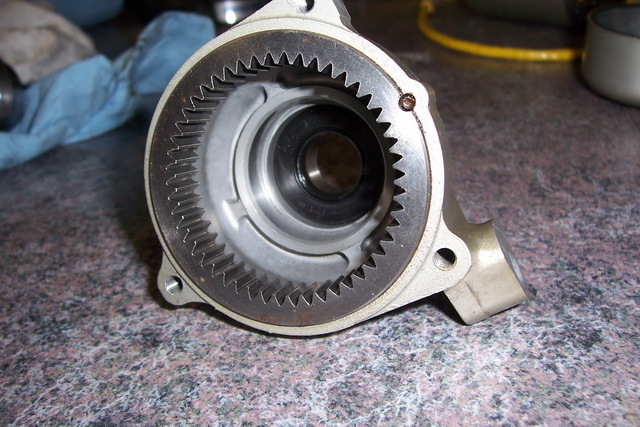 Put a thin layer of grease on the neck of the starter where the â€œOâ€� ring is. This will make the install very easy. 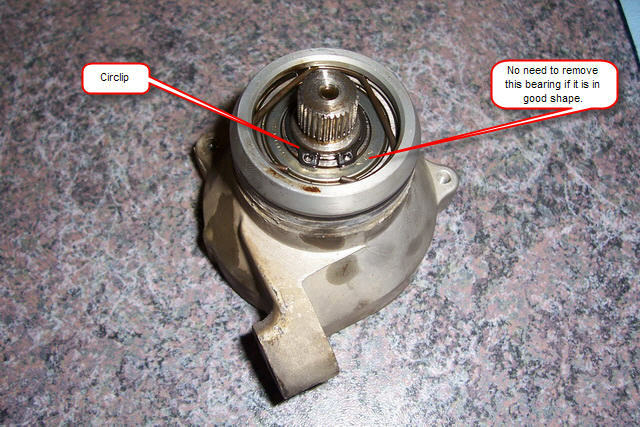 Install the starter back onto the engine opposite to the way you took it off. Be carful in mating it with the cog and chain in the engine. I did it on the first attempt. Itâ€™s very easy when the surfaces are cleaned and lubed. Bolt the starter down. Make sure the power cable has a very clean connection and use a bit of dielectric grease here. 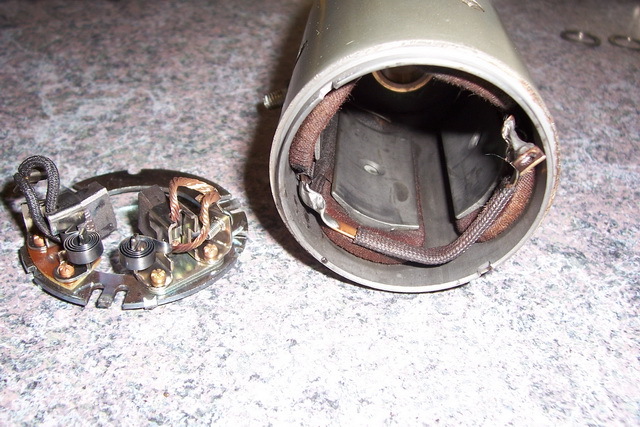 Make sure there is no corrosion in/on the connector. Make sure the rubber boot fits properly over the lip of the insulator.